NHS organisations in Cumbria have united to celebrate the achievements of their staff as part of a new scheme. 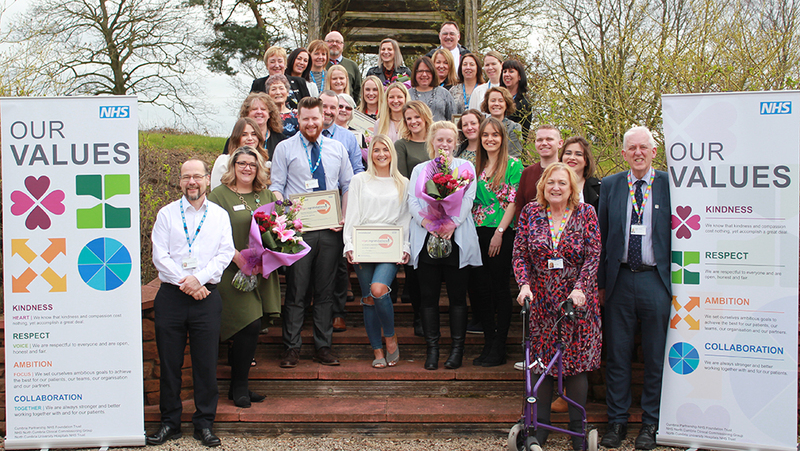 The WeCelebrate staff recognition awards celebrate staff from across the health system including those from Cumbria Partnership NHS Foundation Trust (CPFT), North Cumbria University Hospitals NHS Trust (NCUH), NHS North Cumbria Clinical Commissioning Group (NCCCG) and Primary Care. The awards have been designed to promote and celebrate the fact that organisations continue to work together more closely. Staff were asked to nominate colleagues who they felt deserved to be recognised for going the extra mile. A panel of judges then followed a rigorous process of shortlisting the winners. A small celebration event was held at Stoneybeck Inn near Penrith for all the winners. Outstanding Service Improvement: Maternity Information System Project Team (CPFT and NCUH). A significant reduction in the duplication of health records. Staff have more time to provide care for patients. Patient care plans are now more personalised. Outstanding Leadership: Susan Blakemore, Chief Executive at Cumbria Health on Call. Susan’s leadership has resulted in many highlights including the trail-blazing of several admission avoidance schemes to reduce pressures on A&E attendances, hospital admission and the ambulance service. Susan’s mantra is for the right patient to be seen by the right clinician at the right time and she strives for excellence in all that she, and the service, does. Although Susan wasn’t able to be at the event Dr Neil Margerison, the medical director of Cumbria Health on Call, accepted the award on her behalf. Outstanding Individual: Josephine Harbison, Team Leader, Older Adults Mental Health, South Lakes (CPFT). Through Josephine’s role as team leader, she has supported her team to become the best they can be by being highly motivated, driven and constantly looking at ways they can develop. Josephine has implemented good and efficient ways of working which have both positively impacted on the service and also service users. Outstanding Team of the Year – Clinical: Emergency Department Nursing Team Cumberland Infirmary (NCUH). The Emergency Department Nursing Team at the Cumberland Infirmary have been working hard to demonstrate excellent levels of care and compassion. They respond quickly and professionally to emergencies as they arrive, no matter how busy the departments is, they always demonstrate the ability to adapt to the situation. Evidence of their hard work has recently been demonstrated by the trust being ranked in the top 15 in the country for Emergency Department performance, an incredible achievement for a team working under significant pressure on an almost daily basis. Outstanding Team of the Year – Non Clinical: North Cumbria Clinical Commissioning Group Better Health at Work Team (NCCCG). Last year NCCCG began working towards their Better Health at Work Award. This is an award for employers to look at ways to address health issues within the workplace. The team identified three target areas for staff where they rolled out creative and innovative programmes to get staff involved. This included lunch time walks, mental health awareness sessions and CPR/First Aid Training, plus much more. The team also organised an NHS70 themed local Parkrun which was then taken up nationally up and down the country. The scheme is part of the speech and language therapy department in west Cumbria where therapists and volunteers work in providing a speech and language therapy service to stroke patients. The scheme is totally dependent on the trained volunteers. The volunteers provide an outstanding contribution to supporting stroke patients and give over 250 hours of their time each month to support people who have had a stroke. “We also want to give special recognition to a couple of other areas we feel deserve to be highlighted including the NHS 70th birthday celebration. To celebrate this the NHS in Cumbria hosted numerous celebration events across the county to thank NHS staff for their continued hard work and to also promote the NHS to the public. This involved tea parties, large events showcasing our services, plus a cathedral service. All of this wouldn’t have been possible without the support from our staff working in the NHS.